This is the initial meeting where you will have the opportunity to tell us your hopes and dreams for your new kitchen or bath or any section of your home. Tell us how you want to improve the function and aesthetics of your old kitchen/bath and what new appliances and features you want to include. Feel free to bring to the meeting pictures you have clipped out of magazines or catalogs that will give us an idea of what you are hoping to achieve. 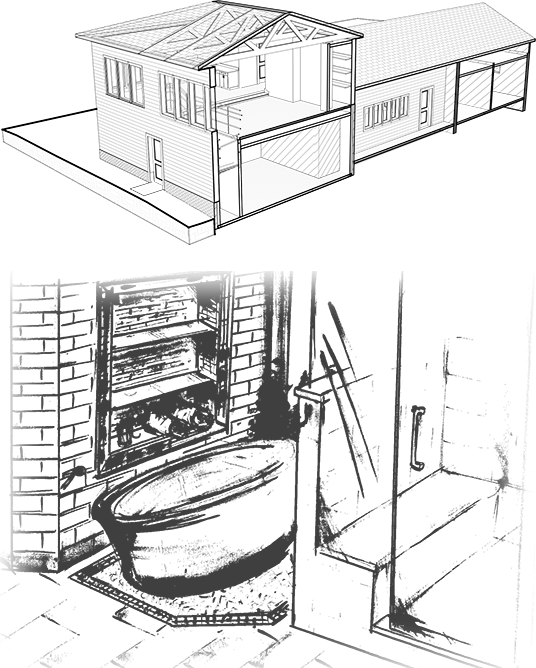 If you have blueprints or a rough sketch of the existing kitchen showing available wall space, doors, windows and ceiling height, please bring that as well for us to use as a basis for our preliminary drawing. We will explore with you the many possibilities of cabinet styles, colors and finishes available until you find the perfect look. Your showroom consultation is free of charge. After we have gathered information from you about your desires and expectations for your new kitchen, we will prepare a preliminary design utilizing your space to achieve the best possible layout. From this design, we will prepare a price quote; and schedule a meeting with you to review the design and pricing. At this meeting we will present our design to you and evaluate it with you to assure that it meets your requests and expectations both functionally and aesthetically. We desire and encourage your involvement. You will be given a quote with prices stated separately for cabinetry, countertops and installation. If you wish to move forward on your project, a retainer agreement will be executed and you will receive the drawings and we will move forward on finalizing your plans. Revisions (if any) will be made to the design based upon decisions at the last meeting, and pricing will be revised accordingly. A meeting will be scheduled to review the plans again and initiate the order process. Upon review and acceptance of the design, the sales contract will be drawn up and signed to authorize placement of the order. You will receive fresh copies of the design now prior to the actual blueprints. If you are purchasing appliances through CSI, specific selections must be made and the order placed to ensure that we have them ready and waiting in our warehouse before your kitchen installation. This is important in the event that an item is backordered, or as is often the case with custom ventilation, there is sufficient time for the item to be produced. Whether or not you are purchasing appliances though CSI, we must know the specific brands and model numbers of all appliances to ensure that the cabinetry we order is the proper size for the appliance specifications. Your electrician and plumber will also need to know in order to properly plan for them. Your selection of countertops should be made as quickly as possible so we can reserve templating and installation dates with our fabricators. Whether you are choosing granite, solid surface, quartz or wood, making these arrangements early will help ensure that your kitchen will be completed without undue delays. Your sink(s), faucet(s) and knobs and/or handles must be chosen, ordered and be present on the job site prior to the cabinetry installation. If you are purchasing these items yourself, you must make your selections early to ensure that they are in stock and on hand. In the case of sinks, your designer can let you know the size limitations for the cabinetry. Don’t forget such accessories as soap dispensers, sprayers, or water dispensers as additional holes must be drilled for them. If we have not already done so, an appointment will be scheduled to visit your home and take field measurements. If your kitchen is a remodel involving a change of wall structure, or brand new construction, measurements will be taken when framing is completed. Final drawings with full dimensions will be prepared and blueprints will be made. You will be sent copies of the blueprints. Our project coordinator will work with you to schedule the installation of your cabinetry. She will notify you when we expect delivery so you can plan to have your old kitchen/bath removed and the space prepared by your contractor with as little delay between the tear-out and the installation as possible. If CSI is doing the remodel project for you, your project coordinator will work directly with your project team leader to coordinate installation on your behalf. You will of course be informed of all timelines throughout your project. The day before, or the day of the installation, we will deliver your new cabinets and appliances. Please have a designated area ready to receive them—usually the garage or other protected area. Installation will usually take from one to five days depending upon the size of your kitchen or bath. Soon after installation, your designer will schedule an appointment with you to review the installation and make note of any work that needs completion. After the cabinets are in place, the countertop fabricators will come to your house to measure and prepare templates. They will then cut the countertops accordingly and install them about 5-10 working days later. Appliances will be installed (whether by us or your source) after the countertops are installed. Our project coordinator will schedule a time convenient to you to do any remaining work. The work is finished and the result is beautiful! Now is the time to relax and have fun using your new kitchen or bath and show it off a little for all your friends and neighbors. With your permission, we would appreciate the opportunity to take photographs of the finished project for our portfolio. I just wanted to thank you for my fabulous new kitchen—it is exactly what I wanted and I can’t tell you how much I have enjoyed it! Working with you, your staff, and the subcontractors you coordinated for me was such a delight! I felt in good hands throughout the entire process. I know that whatever needed to be done would be done and in a timely manner. Thank you for assembling the best people and the best products to make our dream kitchen a reality. After a previous nightmare experience with remodeling, CSI was a truly professional experience. They provided me with a timeline and budget and stuck to both. They made living through a renovation as convenient as possible. All of the workers were courteous and respectful.